New movie based on the escapades of a lawyer who helped free Americans captured by foreign governments during the 1950s and 1960s is only the first of several planned films in the genre. Steven Spielberg has announced a new project in which he has called on the Coen brothers to write a screenplay about the life of James Donovan (1916-1970), a preeminent figure in the spy intrigues of the Cold War. The lead role will be played by Tom Hanks. The Coen brothers expressed their ideas about espionage in their 2008 film Burn After Reading. Their feelings about spycraft can be summarized this way: The world is populated by idiots who are out for blood. Naturally, idiots who work in the intelligence service are more dangerous than ordinary idiots. Speculation about the new film’s plot revolves around the question of how this philosophy will guide the Coen’s depiction of Donovan. In 1957, Donovan (a lawyer and a U.S. naval captain who negotiated on behalf of the U.S. for the release of American citizens held abroad) volunteered to defend a man who went by the name of Rudolf Abel (His real name was Vilyam Fisher). A polyglot, artist, inventor, and head of a U.S.-based intelligence network for nine years, Fisher was one of the Soviet Union’s most valuable intelligence assets. Donovan, who was much admired by Fisher, convinced the court not to sentence him to death, but to 30 years in prison based on a subsequent prisoner exchange. The details of events leading up to Fisher’s arrest are very much the stuff of a Coen movie and are possibly what attracted the brothers to the story. After 11 years carrying out espionage work in the U.S., Fisher arranged the recall of his assistant Reino Häyhänen to Moscow because he was dissatisfied with his subordinate’s poor work. On his way back to the Soviet Union, however, Häyhänen stopped in Paris, where he turned up at the U.S. Embassy drunk and announced his defection. This act triggered the FBI operation that ended in Fisher’s capture. One of the incidents leading to Häyhänen’s recall was that he had mistakenly paid at a newsstand not with the usual five-cent coin, but with a microfilm container disguised as a nickel. The subsequent investigation into the “nickel” by the FBI became known as the Hollow Nickel Case. Donovan also took part in the exchange of Fisher for the pilot Gary Powers, whose plane was downed over the Urals, and two low-ranking Americans, a move complicated by a fake "Madame Abel" and the frontman, "a lawyer by the name of Jurgen Drivsom,” a role played by the future head of the clandestine intelligence service the KGB, Yury Drozdov (who held that post from 1979 to 1991). Donovan later wrote a book, Strangers on a Bridge,about the exchange of Fisher for Powers. More spy films=new Cold War? In addition to the Spielberg film, two spy movies based on books by John Le Carré are also on the way: A Most Wanted Man, to be directed by Anton Corbijn, and Our Kind of Traitor, to be directed by Susanna White. At first glance, this renewal of interest in the spy genre would seem to confirm the popular hypothesis that geopolitical relations have returned to the Cold War. Typically, the number of spy films in production in Hollywood correlates to the level of international tension. During Stalin’s last years, when McCarthyism was rampant, U.S. film studios produced dozens of films in which Communist agents, primarily trade unionists, spread the Red Terror through the towns and cities of the United States. Among them were movies with titles like The Red Menace or Conspirator, in which Elizabeth Taylor played her first adult role. This theory did not hold true in the Soviet Union, however. In 1950, there were just three spy films besides the unfinished and banned film by Alexander Dovzhenko called Goodbye, America. In 1953, there was one more, not counting the film Silver Dust by Mikhail Kalatozov, in which progressive Americans argued with warmongers. Between 1954 and 1955, there were at least 12 Hollywood movies about spies, but gradually the number of such films declined, and by the mid-1970s, when Cold War hysteria had calmed somewhat, the genre almost completely disappeared from cinema screens. 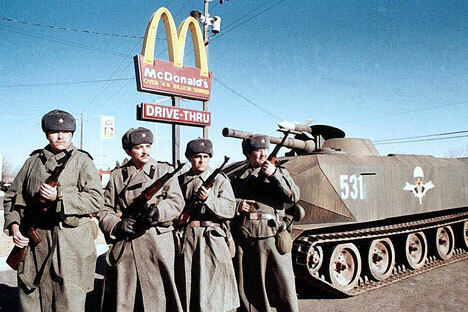 The escalation of tensions under President Ronald Reagan in the 1980s led to a return to the genre in the late Soviet period. Ten spy films were released between 1984 and 1986. Are the U.S. and Russia headed for a new Cold War? Keep an eye on the silver screen.